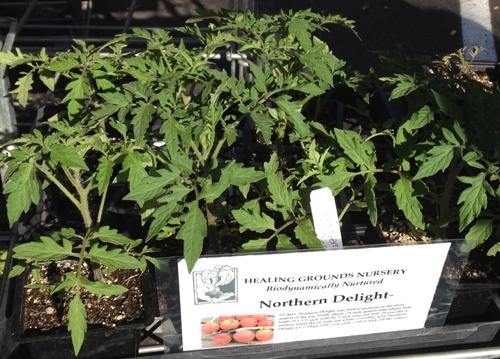 Besides flowers at the Santa Barbara Farmers' Market this morning, we had the Healing Grounds Nursery visions of summer. Healing Grounds nursery is a certified organic nursery and was started in 2004 by Oscar Harmona. Healing Grounds Horticultural Therapy is part of the Transitions Mental Health Program serving clients through the Santa Barbara County Mental Health Services. Healing Grounds Nursery was developed as a way to provide work training and income to adult clients with mental illness. There were racks of tomato varieties to start planting in our gardens, as well as herbs and zucchinis. We were tempted, however, we did not need another to do this weekend. Perhaps, we will buy some for next weekend's projects.